The Fairhope Recreation Center will hold a pickleball demonstration and clinic at 1:30 p.m. Tuesday. Don't get the wrong idea: They won't be hitting dills across a net, shooting gherkins through a basket or throwing the ol' bread-and-butter around. Virginia Corker of Mobile will lead the demonstration. She's an ambassador with the USA Pickleball Association. 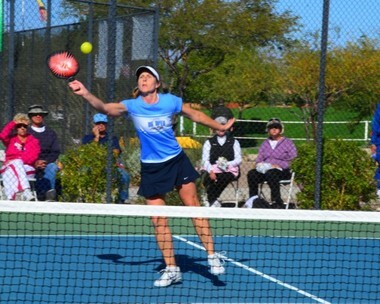 She and her husband, Jerry Corker, teach a pickleball course at Spring Hill College. "It's great for competitive people - that's the fast-paced part of it," Corker said. "But for the recreational people, it's great fun, it's great for your health and it's a great way to meet new people." The court for the clinic will be set up in the basketball gym at the Fairhope Recreation Center. For more information on the demonstration, call 251-928-7270.